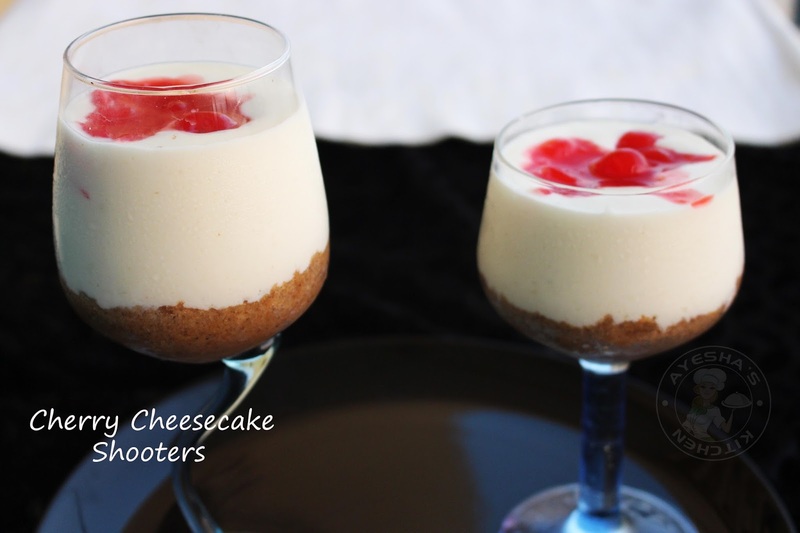 Cheesecake shooters are rich, single serving dessert shooter recipe which is best to serve for a party instead of making cheese cakes. No bake cheesecakes are pretty nice and fun to make. A buttery crust with smooth and creamy cheese cake is worth trying. But i love to make cheese cake shooters for guests instead of no bake cheese cakes. Cheesecake shooters are miniature work of art and absolutely a rich treat. This is super easy ...even my little daughter make shooters for her own. A sugar cookie crust, a cheesecake batter, and some cherries or nuts to top with - this makes a perfect dessert. Do try this shot glass dessert recipe which has all the richness of the cheesecake . It is a great dessert idea for birthday parties. A killer dessert for any occasions. No one loves to stick in the kitchen for long hours making desserts in festive days like Christmas, Diwali, Eid and all. This super easy, quick and rich dessert can be made in minutes with less mess. 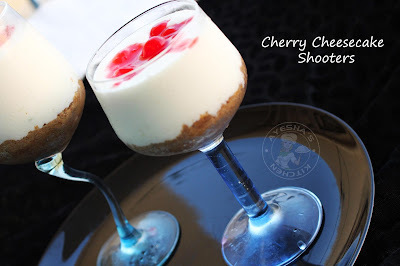 Here is the recipe for cheesecake recipe no bake shots /easy dessert shooter recipe /cherry cheesecake shots /easy shot recipes / no bake cherry cheesecake shooter. Set aside 4 glasses/glass bowls for setting the cheesecake shots. Then prepare the cherry topping by combining cherries (can use fresh or canned) sugar, lemon juice in a pan. Let it boil for a while and then add the cornflour mixture. Again cook well stirring continuously. Once the mixture becomes thick and get a vibrant color, remove from flame. Allow it to cool and so set aside. Now prepare the base for the cheesecake shots. Combine the powdered digestive biscuits with butter and spoon the crumbs into the bottom of small glass bowls. No need of setting a stiff base like that of cheesecakes. Let it set aside. Now add the cream cheese and condensed milk in another bowl. Whip it well and then add the whipping cream, vanilla essence. Again whip until well combined. Spoon it into a pastry bag and pipe it over the biscuit mixture. You can also use a spoon instead of piping bags. And then top it with prepared cherry topping. You can garnish with fresh cherries or nuts and let it cool for 2 hours. Serve chill. NOTES --- You can use Almarai cream cheese cubes or Philadelphia cheese spread or any cream cheese for making this simple dessert. No need of Agar agar or china grass or gelatin for this yummy sweet treat. Topping can be made with mangoes, strawberries, blueberries, raspberries instead of cherries. You can use your favorite fruit for topping this cheesecake shooters.